The new trendy frontrunner – fashion edition of PocketBook Touch HD in alluring ruby red colour. The new trendy PocketBook Touch HD Ruby Red is called up to provide flawless comfort of reading and to fill life with new sensations. The new e-reader is designed in an exclusive colour, which represents classical traditions of sophisticated style and at the same time reflects the latest fashion trends. The fancy ruby red will provoke new desires and dreams. Just like the core model, the exquisite PocketBook Touch HD Ruby Red shows a number of modern characteristics for most luxurious e-reading. The new e-reader is equipped with infrared multisensory E Ink Carta screen with HD resolution (1072 х 1448) and 300 DPI, which guarantees high contrast and sharpness of the e-book page. The built-in LED frontlight allows free and pleasant reading in any lighting conditions. Those who like to listen to audio books or to enjoy music while reading, will highly appreciate the integrated audio features. PocketBook Touch HD Ruby Red supports the mp3 format and has a standard 3.5 mm audio jack. A well-chosen audio background will strengthen the emotional effects of the book. Another valuable characteristic is the Text-to-Speech function, which converts text into spoken voice. This means the e-reader can read aloud any text-file in any of the supported formats. To store the user’s digital library and audio book collection, the e-reader received 8 GB of internal memory and microSD card slot (up to 32 GB). 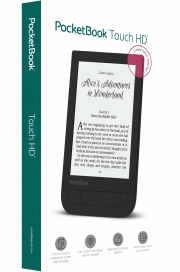 PocketBook Touch HD Ruby Red supports 17 popular book formats without converting as well as 4 graphic formats (JPEG, BMP, PNG, TIFF). Moreover, the library of the PocketBook Touch HD Ruby Red contains 97 preinstalled free e-books in 14 languages, including 8 in English. The preinstalled Abbyy Lingvo® dictionaries are essential for reading foreign books.